Learn some very unique mosaic methods in this fun class. Begin with a theme, such as a favorite story, person, animal, vacation, etc. 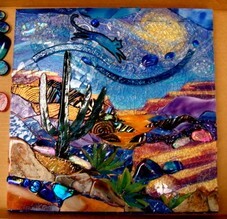 and weave it into a mosaic storyboard using tempered glass, colorful paints, beads and stained glass, and laser images. We will provide tempered glass, boards, and some paints. Students will need to purchase glass, grout, and any other supplies needed. There will be homework outside of class time.